A global manufacturer uses Oracle E-Business Suite as the central repository for sales orders and customer and site information, while its sales teams primarily use Salesforce CRM to create sales opportunities. Neither of these systems were integrated properly which required information to be entered manually into both systems, often leading to duplicate data and errors. To overcome the data deficiency, ennVee built the integration between Salesforce CRM and Oracle E-Business Suite using MuleSoft Anypoint. 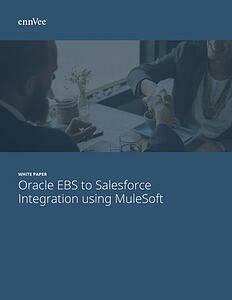 The integration made Oracle EBS the single source of truth and, where customer details and sales orders would be created in Oracle EBS based on the opportunity created in Salesforce.